Microscopy is the technical field of using microscopes to view objects and areas of objects that cannot be seen with the naked eye (objects that are not within the resolution range of the normal eye). There are three well-known branches of microscopy: optical, electron, and scanning probe microscopy, along with the emerging field of X-ray microscopy. Optical microscopy and electron microscopy involve the diffraction, reflection, or refraction of electromagnetic radiation/electron beams interacting with the specimen, and the collection of the scattered radiation or another signal in order to create an image. This process may be carried out by wide-field irradiation of the sample (for example standard light microscopy and transmission electron microscopy) or by scanning a fine beam over the sample (for example confocal laser scanning microscopy and scanning electron microscopy). Scanning probe microscopy involves the interaction of a scanning probe with the surface of the object of interest. 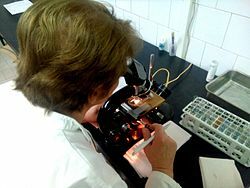 The development of microscopy revolutionized biology, gave rise to the field of histology and so remains an essential technique in the life and physical sciences. X-ray microscopy is three-dimensional and non-destructive, allowing for repeated imaging of the same sample for in situ or 4D studies, and providing the ability to "see inside" the sample being studied before sacrificing it to higher resolution techniques. A 3D X-ray microscope uses the technique of computed tomography (microCT), rotating the sample 360 degrees and reconstructing the images. CT is typically carried out with a flat panel display. A 3D X-ray microscope employs a range of objectives, e.g., from 4X to 40X, and can also include a flat panel. Often considered to be the first acknowledged microscopist and microbiologist, Antonie van Leeuwenhoek is best known for his pioneering work in the field of microscopy and for his contributions toward the establishment of microbiology as a scientific discipline. The field of microscopy (optical microscopy) dates back to at least the 17th-century. Earlier microscopes, single lens magnifying glasses with limited magnification, date at least as far back as the wide spread use of lenses in eyeglasses in the 13th century but more advanced compound microscopes first appeared in Europe around 1620 The earliest practitioners of microscopy include Galileo Galilei, who found in 1610 that he could close focus his telescope to view small objects close up and Cornelis Drebbel, who may have invented the compound microscope around 1620 Antonie van Leeuwenhoek developed a very high magnification simple microscope in the 1670's and is often considered to be the first acknowledged microscopist and microbiologist. Optical or light microscopy involves passing visible light transmitted through or reflected from the sample through a single lens or multiple lenses to allow a magnified view of the sample. The resulting image can be detected directly by the eye, imaged on a photographic plate, or captured digitally. The single lens with its attachments, or the system of lenses and imaging equipment, along with the appropriate lighting equipment, sample stage, and support, makes up the basic light microscope. The most recent development is the digital microscope, which uses a CCD camera to focus on the exhibit of interest. The image is shown on a computer screen, so eye-pieces are unnecessary. This technique can only image dark or strongly refracting objects effectively. Diffraction limits resolution to approximately 0.2 micrometres (see: microscope). This limits the practical magnification limit to ~1500x. Out-of-focus light from points outside the focal plane reduces image clarity. Live cells in particular generally lack sufficient contrast to be studied successfully, since the internal structures of the cell are colorless and transparent. The most common way to increase contrast is to stain the different structures with selective dyes, but this often involves killing and fixing the sample. Staining may also introduce artifacts, which are apparent structural details that are caused by the processing of the specimen and are thus not legitimate features of the specimen. In general, these techniques make use of differences in the refractive index of cell structures. Bright field microscopy is comparable to looking through a glass window: one sees not the glass but merely the dirt on the glass. There is a difference, as glass is a denser material, and this creates a difference in phase of the light passing through. The human eye is not sensitive to this difference in phase, but clever optical solutions have been devised to change this difference in phase into a difference in amplitude (light intensity). In order to improve specimen contrast or highlight certain structures in a sample, special techniques must be used. A huge selection of microscopy techniques are available to increase contrast or label a sample. Four examples of transillumination techniques used to generate contrast in a sample of tissue paper. 1.559 μm/pixel. Bright field illumination, sample contrast comes from absorbance of light in the sample. Cross-polarized light illumination, sample contrast comes from rotation of polarized light through the sample. Dark field illumination, sample contrast comes from light scattered by the sample. Phase contrast illumination, sample contrast comes from interference of different path lengths of light through the sample. Bright field microscopy is the simplest of all the light microscopy techniques. Sample illumination is via transmitted white light, i.e. illuminated from below and observed from above. Limitations include low contrast of most biological samples and low apparent resolution due to the blur of out-of-focus material. The simplicity of the technique and the minimal sample preparation required are significant advantages. The use of oblique (from the side) illumination gives the image a three-dimensional (3D) appearance and can highlight otherwise invisible features. A more recent technique based on this method is Hoffmann's modulation contrast, a system found on inverted microscopes for use in cell culture. Oblique illumination suffers from the same limitations as bright field microscopy (low contrast of many biological samples; low apparent resolution due to out of focus objects). Dark field microscopy is a technique for improving the contrast of unstained, transparent specimens. Dark field illumination uses a carefully aligned light source to minimize the quantity of directly transmitted (unscattered) light entering the image plane, collecting only the light scattered by the sample. Dark field can dramatically improve image contrast – especially of transparent objects – while requiring little equipment setup or sample preparation. However, the technique suffers from low light intensity in final image of many biological samples and continues to be affected by low apparent resolution. Rheinberg illumination is a special variant of dark field illumination in which transparent, colored filters are inserted just before the condenser so that light rays at high aperture are differently colored than those at low aperture (i.e., the background to the specimen may be blue while the object appears self-luminous red). Other color combinations are possible, but their effectiveness is quite variable. Dispersion staining is an optical technique that results in a colored image of a colorless object. This is an optical staining technique and requires no stains or dyes to produce a color effect. There are five different microscope configurations used in the broader technique of dispersion staining. They include brightfield Becke line, oblique, darkfield, phase contrast, and objective stop dispersion staining. Phase-contrast light micrograph of hyaline cartilage showing chondrocytes and organelles, lacunae and extracellular matrix. More sophisticated techniques will show proportional differences in optical density. Phase contrast is a widely used technique that shows differences in refractive index as difference in contrast. It was developed by the Dutch physicist Frits Zernike in the 1930s (for which he was awarded the Nobel Prize in 1953). The nucleus in a cell for example will show up darkly against the surrounding cytoplasm. Contrast is excellent; however it is not for use with thick objects. Frequently, a halo is formed even around small objects, which obscures detail. The system consists of a circular annulus in the condenser, which produces a cone of light. This cone is superimposed on a similar sized ring within the phase-objective. Every objective has a different size ring, so for every objective another condenser setting has to be chosen. The ring in the objective has special optical properties: it, first of all, reduces the direct light in intensity, but more importantly, it creates an artificial phase difference of about a quarter wavelength. As the physical properties of this direct light have changed, interference with the diffracted light occurs, resulting in the phase contrast image. One disadvantage of phase-contrast microscopy is halo formation (halo-light ring). Superior and much more expensive is the use of interference contrast. Differences in optical density will show up as differences in relief. A nucleus within a cell will actually show up as a globule in the most often used differential interference contrast system according to Georges Nomarski. However, it has to be kept in mind that this is an optical effect, and the relief does not necessarily resemble the true shape. Contrast is very good and the condenser aperture can be used fully open, thereby reducing the depth of field and maximizing resolution. The system consists of a special prism (Nomarski prism, Wollaston prism) in the condenser that splits light in an ordinary and an extraordinary beam. The spatial difference between the two beams is minimal (less than the maximum resolution of the objective). After passage through the specimen, the beams are reunited by a similar prism in the objective. In a homogeneous specimen, there is no difference between the two beams, and no contrast is being generated. However, near a refractive boundary (say a nucleus within the cytoplasm), the difference between the ordinary and the extraordinary beam will generate a relief in the image. Differential interference contrast requires a polarized light source to function; two polarizing filters have to be fitted in the light path, one below the condenser (the polarizer), and the other above the objective (the analyzer). Note: In cases where the optical design of a microscope produces an appreciable lateral separation of the two beams we have the case of classical interference microscopy, which does not result in relief images, but can nevertheless be used for the quantitative determination of mass-thicknesses of microscopic objects. An additional technique using interference is interference reflection microscopy (also known as reflected interference contrast, or RIC). It relies on cell adhesion to the slide to produce an interference signal. If there is no cell attached to the glass, there will be no interference. Interference reflection microscopy can be obtained by using the same elements used by DIC, but without the prisms. Also, the light that is being detected is reflected and not transmitted as it is when DIC is employed. Images may also contain artifacts. This is a confocal laser scanning fluorescence micrograph of thale cress anther (part of stamen). The picture shows among other things a nice red flowing collar-like structure just below the anther. However, an intact thale cress stamen does not have such collar, this is a fixation artifact: the stamen has been cut below the picture frame, and epidermis (upper layer of cells) of stamen stalk has peeled off, forming a non-characteristic structure. Photo: Heiti Paves from Tallinn University of Technology. When certain compounds are illuminated with high energy light, they emit light of a lower frequency. 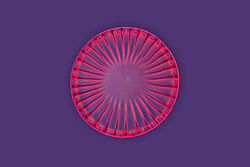 This effect is known as fluorescence. Often specimens show their characteristic autofluorescence image, based on their chemical makeup. This method is of critical importance in the modern life sciences, as it can be extremely sensitive, allowing the detection of single molecules. Many different fluorescent dyes can be used to stain different structures or chemical compounds. One particularly powerful method is the combination of antibodies coupled to a fluorophore as in immunostaining. Examples of commonly used fluorophores are fluorescein or rhodamine. The antibodies can be tailor-made for a chemical compound. For example, one strategy often in use is the artificial production of proteins, based on the genetic code (DNA). These proteins can then be used to immunize rabbits, forming antibodies which bind to the protein. The antibodies are then coupled chemically to a fluorophore and used to trace the proteins in the cells under study. Highly efficient fluorescent proteins such as the green fluorescent protein (GFP) have been developed using the molecular biology technique of gene fusion, a process that links the expression of the fluorescent compound to that of the target protein. This combined fluorescent protein is, in general, non-toxic to the organism and rarely interferes with the function of the protein under study. Genetically modified cells or organisms directly express the fluorescently tagged proteins, which enables the study of the function of the original protein in vivo. Growth of protein crystals results in both protein and salt crystals. Both are colorless and microscopic. Recovery of the protein crystals requires imaging which can be done by the intrinsic fluorescence of the protein or by using transmission microscopy. Both methods require an ultraviolet microscope as protein absorbs light at 280 nm. Protein will also fluorescence at approximately 353 nm when excited with 280 nm light. Since fluorescence emission differs in wavelength (color) from the excitation light, an ideal fluorescent image shows only the structure of interest that was labeled with the fluorescent dye. This high specificity led to the widespread use of fluorescence light microscopy in biomedical research. Different fluorescent dyes can be used to stain different biological structures, which can then be detected simultaneously, while still being specific due to the individual color of the dye. To block the excitation light from reaching the observer or the detector, filter sets of high quality are needed. These typically consist of an excitation filter selecting the range of excitation wavelengths, a dichroic mirror, and an emission filter blocking the excitation light. Most fluorescence microscopes are operated in the Epi-illumination mode (illumination and detection from one side of the sample) to further decrease the amount of excitation light entering the detector. An example of fluorescence microscopy today is two-photon or multi-photon imaging. Two photon imaging allows imaging of living tissues up to a very high depth by enabling greater excitation light penetration and reduced background emission signal. Confocal microscopy uses a scanning point of light and a pinhole to prevent out of focus light from reaching the detector. Compared to full sample illumination, confocal microscopy gives slightly higher resolution, and significantly improves optical sectioning. Confocal microscopy is, therefore, commonly used where 3D structure is important. Using a plane of light formed by focusing light through a cylindrical lens at a narrow angle or by scanning a line of light in a plane perpendicular to the axis of objective, high resolution optical sections can be taken. Single plane illumination, or light sheet illumination, is also accomplished using beam shaping techniques incorporating multiple-prism beam expanders. The images are captured by CCDs. These variants allow very fast and high signal to noise ratio image capture. Wide-field multiphoton microscopy refers to an optical non-linear imaging technique tailored for ultrafast imaging in which a large area of the object is illuminated and imaged without the need for scanning. High intensities are required to induce non-linear optical processes such as two-photon fluorescence or second harmonic generation. In scanning multiphoton microscopes the high intensities are achieved by tightly focusing the light, and the image is obtained by stage- or beam-scanning the sample. In wide-field multiphoton microscopy the high intensities are best achieved using an optically amplified pulsed laser source to attain a large field of view (~100 µm). The image in this case is obtained as a single frame with a CCD without the need of scanning, making the technique particularly useful to visualize dynamic processes simultaneously across the object of interest. With wide-field multiphoton microscopy the frame rate can be increased up to a 1000-fold compared to multiphoton scanning microscopy. Fluorescence microscopy is a powerful technique to show specifically labeled structures within a complex environment and to provide three-dimensional information of biological structures. However, this information is blurred by the fact that, upon illumination, all fluorescently labeled structures emit light, irrespective of whether they are in focus or not. So an image of a certain structure is always blurred by the contribution of light from structures that are out of focus. This phenomenon results in a loss of contrast especially when using objectives with a high resolving power, typically oil immersion objectives with a high numerical aperture. Mathematically modeled Point Spread Function of a pulsed THz laser imaging system. However, blurring is not caused by random processes, such as light scattering, but can be well defined by the optical properties of the image formation in the microscope imaging system. If one considers a small fluorescent light source (essentially a bright spot), light coming from this spot spreads out further from our perspective as the spot becomes more out of focus. Under ideal conditions, this produces an "hourglass" shape of this point source in the third (axial) dimension. This shape is called the point spread function (PSF) of the microscope imaging system. Since any fluorescence image is made up of a large number of such small fluorescent light sources, the image is said to be "convolved by the point spread function". The mathematically modeled PSF of a terahertz laser pulsed imaging system is shown on the right. Where n is the additive noise. Knowing this point spread function means that it is possible to reverse this process to a certain extent by computer-based methods commonly known as deconvolution microscopy. There are various algorithms available for 2D or 3D deconvolution. They can be roughly classified in nonrestorative and restorative methods. While the nonrestorative methods can improve contrast by removing out-of-focus light from focal planes, only the restorative methods can actually reassign light to its proper place of origin. Processing fluorescent images in this manner can be an advantage over directly acquiring images without out-of-focus light, such as images from confocal microscopy, because light signals otherwise eliminated become useful information. For 3D deconvolution, one typically provides a series of images taken from different focal planes (called a Z-stack) plus the knowledge of the PSF, which can be derived either experimentally or theoretically from knowing all contributing parameters of the microscope. Example of super-resolution microscopy. Image of Her3 and Her2, target of the breast cancer drug Trastuzumab, within a cancer cell. A multitude of super-resolution microscopy techniques have been developed in recent times which circumvent the diffraction barrier. This is mostly achieved by imaging a sufficiently static sample multiple times and either modifying the excitation light or observing stochastic changes in the image. The deconvolution methods described in the previous section, which removes the PSF induced blur and assigns a mathematically 'correct' origin of light, are used, albeit with slightly different understanding of what the value of a pixel mean. Assuming most of the time, one single fluorophore contributes to one single blob on one single taken image, the blobs in the images can be replaced with their calculated position, vastly improving resolution to well below the diffraction limit. To realize such assumption, Knowledge of and chemical control over fluorophore photophysics is at the core of these techniques, by which resolutions of ~20 nanometers are regularly obtained. Serial time encoded amplified microscopy (STEAM) is an imaging method that provides ultrafast shutter speed and frame rate, by using optical image amplification to circumvent the fundamental trade-off between sensitivity and speed, and a single-pixel photodetector to eliminate the need for a detector array and readout time limitations  The method is at least 1000 times faster than the state-of-the-art CCD and CMOS cameras. Consequently, it is potentially useful for a broad range of scientific, industrial, and biomedical applications that require high image acquisition rates, including real-time diagnosis and evaluation of shockwaves, microfluidics, MEMS, and laser surgery. Most modern instruments provide simple solutions for micro-photography and image recording electronically. However such capabilities are not always present and the more experienced microscopist will, in many cases, still prefer a hand drawn image to a photograph. This is because a microscopist with knowledge of the subject can accurately convert a three-dimensional image into a precise two-dimensional drawing. In a photograph or other image capture system however, only one thin plane is ever in good focus. 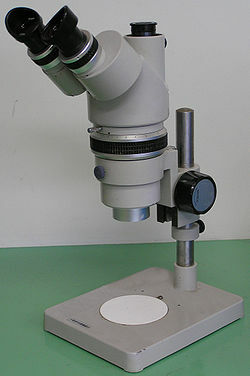 The creation of careful and accurate micrographs requires a microscopical technique using a monocular eyepiece. It is essential that both eyes are open and that the eye that is not observing down the microscope is instead concentrated on a sheet of paper on the bench besides the microscope. With practice, and without moving the head or eyes, it is possible to accurately record the observed details by tracing round the observed shapes by simultaneously "seeing" the pencil point in the microscopical image. Practicing this technique also establishes good general microscopical technique. It is always less tiring to observe with the microscope focused so that the image is seen at infinity and with both eyes open at all times. As resolution depends on the wavelength of the light. Electron microscopy has been developed since the 1930s that use electron beams instead of light. Because of the much smaller wavelength of the electron beam, resolution is far higher. Though less common, X-ray microscopy has also been developed since the late 1940s. The resolution of X-ray microscopy lies between that of light microscopy and electron microscopy. Until the invention of sub-diffraction microscopy, the wavelength of the light limited the resolution of traditional microscopy to around 0.2 micrometers. In order to gain higher resolution, the use of an electron beam with a far smaller wavelength is used in electron microscopes. Transmission electron microscopy (TEM) is quite similar to the compound light microscope, by sending an electron beam through a very thin slice of the specimen. The resolution limit in 2005 was around 0.05[dubious – discuss] nanometer and has not increased appreciably since that time. Scanning electron microscopy (SEM) visualizes details on the surfaces of specimens and gives a very nice 3D view. It gives results much like those of the stereo light microscope. The best resolution for SEM in 2011 was 0.4 nanometer. 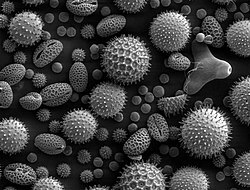 Electron microscopes equipped for X-ray spectroscopy can provide qualitative and quantitative elemental analysis. This type of electron microscope, also known as analytical electron microscope, can be a very powerful characterisation tool for investigation of nanomaterials. This is a sub-diffraction technique. Examples of scanning probe microscopes are the atomic force microscope (AFM), the Scanning tunneling microscope, the photonic force microscope and the recurrence tracking microscope. All such methods use the physical contact of a solid probe tip to scan the surface of an object, which is supposed to be almost flat. Ultrasonic force microscopy (UFM) has been developed in order to improve the details and image contrast on "flat" areas of interest where AFM images are limited in contrast. The combination of AFM-UFM allows a near field acoustic microscopic image to be generated. The AFM tip is used to detect the ultrasonic waves and overcomes the limitation of wavelength that occurs in acoustic microscopy. By using the elastic changes under the AFM tip, an image of much greater detail than the AFM topography can be generated. Ultrasonic force microscopy allows the local mapping of elasticity in atomic force microscopy by the application of ultrasonic vibration to the cantilever or sample. In an attempt to analyze the results of ultrasonic force microscopy in a quantitative fashion, a force-distance curve measurement is done with ultrasonic vibration applied to the cantilever base, and the results are compared with a model of the cantilever dynamics and tip-sample interaction based on the finite-difference technique. Ultraviolet microscopes have two main purposes. The first is to utilize the shorter wavelength of ultraviolet electromagnetic energy to improve the image resolution beyond that of the diffraction limit of standard optical microscopes. This technique is used for non-destructive inspection of devices with very small features such as those found in modern semiconductors. The second application for UV microscopes is contrast enhancement where the response of individual samples is enhanced, relative to their surrounding, due to the interaction of light with the molecules within the sample itself. One example is in the growth of protein crystals. Protein crystals are formed in salt solutions. As salt and protein crystals are both formed in the growth process, and both are commonly transparent to the human eye, they cannot be differentiated with a standard optical microscope. As the tryptophan of protein absorbs light at 280 nm, imaging with a UV microscope with 280 nm bandpass filters makes it simple to differentiate between the two types of crystals. The protein crystals appear dark while the salt crystals are transparent. The term infrared microscopy refers to microscopy performed at infrared wavelengths. In the typical instrument configuration, a Fourier Transform Infrared Spectrometer (FTIR) is combined with an optical microscope and an infrared detector. The infrared detector can be a single point detector, a linear array or a 2D focal plane array. The FTIR provides the ability to perform chemical analysis via infrared spectroscopy and the microscope and point or array detector enable this chemical analysis to be spatially resolved, i.e. performed at different regions of the sample. As such, the technique is also called infrared microspectroscopy  (an alternative architecture involves the combination of a tuneable infrared light source and single point detector on a flying objective). This technique is frequently used for infrared chemical imaging, where the image contrast is determined by the response of individual sample regions to particular IR wavelengths selected by the user, usually specific IR absorption bands and associated molecular resonances . A key limitation of conventional infrared microspectroscopy is that the spatial resolution is diffraction-limited. Specifically the spatial resolution is limited to a figure related to the wavelength of the light. For practical IR microscopes, the spatial resolution is limited to 1-3X the wavelength, depending on the specific technique and instrument used. For mid-IR wavelengths, this sets a practical spatial resolution limit of ~3-30 μm. IR versions of sub-diffraction microscopy (see above) also exist. These include IR NSOM, photothermal microspectroscopy, and atomic force microscope based infrared spectroscopy (AFM-IR). 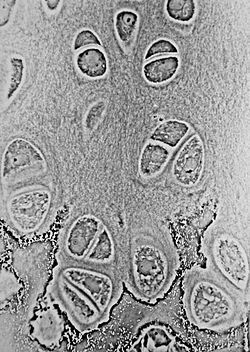 Human cells imaged by DHM phase shift (left) and phase contrast microscopy (right). In digital holographic microscopy (DHM), interfering wave fronts from a coherent (monochromatic) light-source are recorded on a sensor. The image is digitally reconstructed by a computer from the recorded hologram. Besides the ordinary bright field image, a phase shift image is created. DHM can operate both in reflection and transmission mode. In reflection mode, the phase shift image provides a relative distance measurement and thus represents a topography map of the reflecting surface. In transmission mode, the phase shift image provides a label-free quantitative measurement of the optical thickness of the specimen. Phase shift images of biological cells are very similar to images of stained cells and have successfully been analyzed by high content analysis software. A unique feature of DHM is the ability to adjust focus after the image is recorded, since all focus planes are recorded simultaneously by the hologram. This feature makes it possible to image moving particles in a volume or to rapidly scan a surface. Another attractive feature is DHM’s ability to use low cost optics by correcting optical aberrations by software. Digital pathology is an image-based information environment enabled by computer technology that allows for the management of information generated from a digital slide. Digital pathology is enabled in part by virtual microscopy, which is the practice of converting glass slides into digital slides that can be viewed, managed, and analyzed. Laser microscopy is a rapidly growing field that uses laser illumination sources in various forms of microscopy. For instance, laser microscopy focused on biological applications uses ultrashort pulse lasers, in a number of techniques labeled as nonlinear microscopy, saturation microscopy, and two-photon excitation microscopy. High-intensity, short-pulse laboratory x-ray lasers have been under development for several years. When this technology comes to fruition, it will be possible to obtain magnified three-dimensional images of elementary biological structures in the living state at a precisely defined instant. For optimum contrast between water and protein and for best sensitivity and resolution, the laser should be tuned near the nitrogen line at about 0.3 nanometers. Resolution will be limited mainly by the hydrodynamic expansion that occurs while the necessary number of photons is being registered. Thus, while the specimen is destroyed by the exposure, its configuration can be captured before it explodes. Scientists have been working on practical designs and prototypes for x-ray holographic microscopes, despite the prolonged development of the appropriate laser. A microscopy technique relying on the photoacoustic effect, i.e. the generation of (ultra)sound caused by light absorption. A focused and intensity modulated laser beam is raster scanned over a sample. The generated (ultra)sound is detected via an ultrasound transducer. Commonly, piezoelectric ultrasound transducers are employed. is the sample's band gap energy. Therefore, photoacoustic microscopy seems well suited as a complementary technique to fluorescence microscopy, as a high fluorescence quantum yield leads to high fluorescence signals and a low fluorescence quantum yield leads to high photoacoustic signals. is the wavelength of the excitation laser and NA is the numerical aperture of the objective lens. The Abbe diffraction limit holds if the incoming wave front is parallel. In reality, however, the laser beam profile is Gaussian. Therefore, in order to the calculate the achievable resolution, formulas for truncated Gaussian beams have to be used. Amateur Microscopy is the investigation and observation of biological and non-biological specimens for recreational purposes. Collectors of minerals, insects, seashells, and plants may use microscopes as tools to uncover features that help them classify their collected items. Other amateurs may be interested in observing the life found in pond water and of other samples. Microscopes may also prove useful for the water quality assessment for people that keep a home aquarium. Photographic documentation and drawing of the microscopic images are additional tasks that augment the spectrum of tasks of the amateur. There are even competitions for photomicrograph art. Participants of this pastime may either use commercially prepared microscopic slides or engage in the task of specimen preparation. While microscopy is a central tool in the documentation of biological specimens, it is, in general, insufficient to justify the description of a new species based on microscopic investigations alone. Often genetic and biochemical tests are necessary to confirm the discovery of a new species. A laboratory and access to academic literature is a necessity, which is specialized and, in general, not available to amateurs. There is, however, one huge advantage that amateurs have above professionals: time to explore their surroundings. Often, advanced amateurs team up with professionals to validate their findings and (possibly) describe new species. In the late 1800s, amateur microscopy became a popular hobby in the United States and Europe. Several 'professional amateurs' were being paid for their sampling trips and microscopic explorations by philanthropists, to keep them amused on the Sunday afternoon (e.g., the diatom specialist A. Grunow, being paid by (among others) a Belgian industrialist). Professor John Phin published "Practical Hints on the Selection and Use of the Microscope (Second Edition, 1878)," and was also the editor of the "American Journal of Microscopy." Microscopy has many applications in the forensic sciences; it provides precision, quality, accuracy, and reproducibility of results. These applications are almost limitless. This is due to the ability of microscope to detect, resolve and image the smallest items of evidence, often without any alteration or destruction. The microscope is used to identify and compare fibers, hairs, soils, and dust…etc. The aim of any microscope is to magnify images or photos of a small object and to see fine details. In forensic; the type of specimen, the information one wishes to obtain from it and the type of microscope chosen for the task will determine if the sample preparation is required. For example, ink lines, blood stains or bullets, no treatment is required and the evidence shows directly from appropriate microscope without any form of sample preparation, but for traces of particular matter, the sample preparation must be done before microscopical examination occurs. This diversity of the types of microscopes in forensic applications comes mainly from their magnification ranges, which are (1- 1200X), (50 -30,000X) and (500- 250,000X) for the optical microscopy, SEM and TEM respectively. ^ The University of Edinburgh (March 6, 2018). "What is Microscopy?". The University of Edinburgh. Retrieved April 9, 2018. ^ a b Ford, Brian J. (1992). "From Dilettante to Diligent Experimenter: a Reappraisal of Leeuwenhoek as microscopist and investigator". Biology History. 5 (3). ^ Albert Van Helden; Sven Dupré; Rob van Gent (2010). The Origins of the Telescope. Amsterdam University Press. p. 24. ISBN 978-90-6984-615-6. Archived from the original on 15 February 2017. ^ Abramowitz M, Davidson MW (2007). "Introduction to Microscopy". Molecular Expressions. Retrieved 2007-08-22. ^ Abramowitz M, Davidson MW (2003-08-01). "Darkfield Illumination". Retrieved 2008-10-21. ^ Abramowitz M, Davidson MW (2003-08-01). "Rheinberg Illumination". Retrieved 2008-10-21. ^ Gill, Harindarpal (January 2010). "Evaluating the efficacy of tryptophan fluorescence and absorbance as a selection tool for identifying protein crystals". Acta Crystallographica. F66 (Pt 3): 364–372. doi:10.1107/S1744309110002022. PMC 2833058. PMID 20208182. ^ Voie, A.H. (1993). "Imaging the intact guinea pig tympanic bulla by orthogonal-plane fluorescence optical sectioning microscopy". Hearing Research. 71 (1–2): 119–128. doi:10.1016/S0378-5955(02)00493-8. ISSN 0378-5955. ^ Greger, K.; J. Swoger; E. H. K. Stelzer (2007). "Basic building units and properties of a fluorescence single plane illumination microscope". Review of Scientific Instruments. 78 (2): 023705–023705–7. Bibcode:2007RScI...78b3705G. doi:10.1063/1.2428277. ISSN 0034-6748. PMID 17578115. Archived from the original on 2012-07-12. Retrieved 2011-10-16. ^ Buytaert, J.A.N. ; E. Descamps; D. Adriaens; J.J.J. Dirckx (2012). "The OPFOS Microscopy Family: High-Resolution Optical Sectioning of Biomedical Specimens". Anatomy Research International. 2012: 206238. arXiv:1106.3162. doi:10.1155/2012/206238. ISSN 2090-2743. PMC 3335623. PMID 22567307. ^ F. J. Duarte, in High Power Dye Lasers (Springer-Verlag, Berlin,1991) Chapter 2. ^ Duarte FJ (1993), Electro-optical interferometric microdensitometer system, US Patent 5255069. ^ a b Peterson, Mark D.; Hayes, Patrick L.; Martinez, Imee Su; Cass, Laura C.; Achtyl, Jennifer L.; Weiss, Emily A.; Geiger, Franz M. (2011-05-01). "Second harmonic generation imaging with a kHz amplifier [Invited]". Optical Materials Express. 1 (1): 57. Bibcode:2011OMExp...1...57P. doi:10.1364/ome.1.000057. ^ a b c Macias-Romero, Carlos; Didier, Marie E. P.; Jourdain, Pascal; Marquet, Pierre; Magistretti, Pierre; Tarun, Orly B.; Zubkovs, Vitalijs; Radenovic, Aleksandra; Roke, Sylvie (2014-12-15). "High throughput second harmonic imaging for label-free biological applications". Optics Express. 22 (25): 31102–12. Bibcode:2014OExpr..2231102M. doi:10.1364/oe.22.031102. PMID 25607059. ^ a b Cheng, Li-Chung; Chang, Chia-Yuan; Lin, Chun-Yu; Cho, Keng-Chi; Yen, Wei-Chung; Chang, Nan-Shan; Xu, Chris; Dong, Chen Yuan; Chen, Shean-Jen (2012-04-09). "Spatiotemporal focusing-based widefield multiphoton microscopy for fast optical sectioning". Optics Express. 20 (8): 8939–48. Bibcode:2012OExpr..20.8939C. doi:10.1364/oe.20.008939. PMID 22513605. ^ Oron, Dan; Tal, Eran; Silberberg, Yaron (2005-03-07). "Scanningless depth-resolved microscopy". Optics Express. 13 (5): 1468. Bibcode:2005OExpr..13.1468O. doi:10.1364/opex.13.001468. ^ Ahi, Kiarash; Anwar, Mehdi (2016-05-26). "Modeling of terahertz images based on x-ray images: a novel approach for verification of terahertz images and identification of objects with fine details beyond terahertz resolution". Terahertz Physics, Devices, and Systems X: Advanced Applications in Industry. Terahertz Physics, Devices, and Systems X: Advanced Applications in Industry and Defense. 9856: 985610. doi:10.1117/12.2228685. ^ Solomon, Chris (2010). Fundamentals of Digital Image Processing. John Wiley & Sons, Ltd. ISBN 978 0 470 84473 1. ^ Nasse M. J.; Woehl J. C. (2010). "Realistic modeling of the illumination point spread function in confocal scanning optical microscopy". J. Opt. Soc. Am. A. 27 (2): 295–302. Bibcode:2010JOSAA..27..295N. doi:10.1364/JOSAA.27.000295. PMID 20126241. ^ Wallace W, Schaefer LH, Swedlow JR (2001). "A workingperson's guide to deconvolution in light microscopy". BioTechniques. 31 (5): 1076–8, 1080, 1082 passim. doi:10.2144/01315bi01. PMID 11730015. ^ Kaufmann Rainer; Müller Patrick; Hildenbrand Georg; Hausmann Michael; Cremer Christoph (2010). "Analysis of Her2/neu membrane protein clusters in different types of breast cancer cells using localization microscopy". Journal of Microscopy. 242 (1): 46–54. CiteSeerX 10.1.1.665.3604. doi:10.1111/j.1365-2818.2010.03436.x. PMID 21118230. ^ van de Linde S.; Wolter S.; Sauer S. (2011). "Single-molecule Photoswitching and Localization". Aust. J. Chem. 64 (5): 503–511. doi:10.1071/CH10284. ^ K. Goda; K. K. Tsia; B. Jalali (2009). "Serial time-encoded amplified imaging for real-time observation of fast dynamic phenomena". Nature. 458 (7242): 1145–9. Bibcode:2009Natur.458.1145G. doi:10.1038/nature07980. PMID 19407796. ^ Kosasih, Felix Utama; Ducati, Caterina (May 2018). "Characterising degradation of perovskite solar cells through in-situ and operando electron microscopy". Nano Energy. 47: 243–256. doi:10.1016/j.nanoen.2018.02.055. ^ a b Pollock Hubert M (2014). Microspectroscopy in the Mid-Infrared. Encyclopedia of Analytical Chemistry. pp. 1–26. doi:10.1002/9780470027318.a5609.pub2. ISBN 9780470027318. ^ Duarte FJ (2016). "Tunable laser microscopy". In Duarte FJ (ed.). Tunable Laser Applications (3rd ed.). Boca Raton: CRC Press. pp. 315–328. ISBN 9781482261066. ^ Thomas JL, Rudolph W (2008). "Biological Microscopy with Ultrashort Laser Pulses". In Duarte FJ (ed.). Tunable Laser Applications (2nd ed.). Boca Raton: CRC Press. pp. 245–80. ISBN 978-1-4200-6009-6. ^ Solem, J. C. (1983). "X-ray imaging on biological specimens". Proceedings of International Conference on Lasers '83: 635–640. OSTI 5998195. ^ Solem, J. C. (1982). "High-intensity x-ray holography: An approach to high-resolution snapshot imaging of biological specimens". Los Alamos National Laboratory Technical Report LA-9508-MS. doi:10.2172/7056325. OSTI 7056325. ^ Solem, J. C.; Baldwin, G. C. (1982). "Microholography of living organisms". Science. 218 (4569): 229–235. Bibcode:1982Sci...218..229S. doi:10.1126/science.218.4569.229. PMID 17838608. ^ Solem, J. C.; Chapline, G. F. (1984). "X-ray biomicroholography". Optical Engineering. 23 (2): 193. Bibcode:1984OptEn..23..193S. doi:10.1117/12.7973410. ^ Solem, J. C. (1985). "Microholography". McGraw-Hill Encyclopedia of Science and Technology. ^ Solem, J. C. (1984). "X-ray holography of biological specimens". Proceedings of Ninth International Congress on Photobiology, Philadelphia, PA, USA, 3 July 1984 (LA-UR–84-3340, CONF-840783–3): 19. OSTI 6314558. ^ Solem, J. C. (1986). "Imaging biological specimens with high-intensity soft X-rays". Journal of the Optical Society of America B. 3 (11): 1551–1565. Bibcode:1986JOSAB...3.1551S. doi:10.1364/josab.3.001551. ^ Haddad, W. S.; Solem, J. C.; Cullen, D.; Boyer, K.; Rhodes, C. K. (1987). "A description of the theory and apparatus for digital reconstruction of Fourier transform holograms", Proceedings of Electronics Imaging '87, Nov. 2-5, 1987, Boston; Journal of Electronic Imaging, (Institute for Graphic Communication, Inc., Boston), p. 693. ^ Haddad, W. S.; Cullen, D.; Boyer, K.; Rhodes, C. K.; Solem, J. C.; Weinstein, R. S. (1988). Design for a Fourier-transform holographic microscope. Proceedings of International Symposium on X-Ray Microscopy II, Springer Series in Optical Sciences. Springer Series in Optical Sciences. 56. pp. 284–287. doi:10.1007/978-3-540-39246-0_49. ISBN 978-3-662-14490-9. ^ Haddad, W. S.; Solem, J. C.; Cullen, D.; Boyer, K.; Rhodes, C. K. (1988). "Design for a Fourier-transform holographic microscope incorporating digital image reconstruction". Proceedings of CLEO '88 Conference on Lasers and Electro-Optics, Anaheim, CA, April, 1988; Optical Society of America, OSA Technical Digest. 7: WS4. ^ Haddad, W. S.; Cullen, D.; Solem, J. C.; Boyer, K.; Rhodes, C. K. (1988). "X-ray Fourier-transform holographic microscope". Proceedings of the OSA Topical Meeting on Short Wavelength Coherent Radiation: Generation and Applications, September 26–29, 1988, Cape Cod, MA., Falcone, R.; Kirz, J.; Eds. (Optical Society of America, Washington, DC): 284–289. ^ Solem, J. C.; Boyer, K.; Haddad, W. S.; Rhodes, C. K. (1990). Prosnitz, D.; ed. SPIE. "Prospects for X-ray holography with free-electron lasers". Free Electron Lasers and Applications. Free-Electron Lasers and Applications. 1227: 105–116. doi:10.1117/12.18609. ^ Haddad, W. S.; Cullen, D.; Solem, J. C.; Longworth, J. W.; McPherson, L. A.; Boyer, K.; Rhodes, C. K. (1991). "Fourier-transform holographic microscope". Proceedings of SPIE Electronic Imaging '91, San Jose, CA; International Society for Optics and Photonics. Camera and Input Scanner Systems. 1448: 81–88. doi:10.1117/12.45347. ^ Haddad, W. S.; Cullen, D.; Solem, J. C.; Longworth, J.; McPherson, A.; Boyer, K.; Rhodes, C. K. (1992). "Fourier-transform holographic microscope". Applied Optics. 31 (24): 4973–4978. Bibcode:1992ApOpt..31.4973H. doi:10.1364/ao.31.004973. PMID 20733659. ^ Boyer, K.; Solem, J. C.; Longworth, J.; Borisov, A.; Rhodes, C. K. (1996). "Biomedical three-dimensional holographic microimaging at visible, ultraviolet and X-ray wavelengths". Nature Medicine. 2 (8): 939–941. doi:10.1038/nm0896-939. ^ Bell, A. G. (1880). "On the production and reproduction of sound by light". American Journal of Science. s3-20 (118): 305–324. doi:10.2475/ajs.s3-20.118.305. ^ Yao, J.; Wang, L. V. (2013). "Photoacoustic Microscopy". Laser Photon Rev. 7 (5): 1–36. Bibcode:2013LPRv....7..758Y. doi:10.1002/lpor.201200060. PMC 3887369. PMID 24416085. ^ Langer, G.; Buchegger, B.; Jacak, J.; Klar, T. A.; Berer, T. (2016). "Frequency domain photoacoustic and fluorescence microscopy". Biomedical Optics Express. 7 (7): 2692–702. doi:10.1364/BOE.7.002692. PMC 4948622. PMID 27446698. ^ Kotrly M (August 2015). "New Possibilities of Using Micrscopic Techniques in Forensic Field". Proceedings of Microscopy & Microanallysis. 21 (S3): 1365–1366. Bibcode:2015MiMic..21S1365K. doi:10.1017/S1431927615007618. ^ a b Basu S, Millette JR (1986). Electron Microscopy in Forensic Occupational and Environmental Health Sciences. New York: Plenum Press. Wikimedia Commons has media related to Microscopes. Microscopy glossary, Common terms used in amateur light microscopy. Carl Zeiss "Microscopy from the very beginning", a step by step tutorial into the basics of microscopy. Manawatu Microscopy - first known collaboration environment for Microscopy and Image Analysis. Interactive Fluorescence Dye and Filter Database Carl Zeiss Interactive Fluorescence Dye and Filter Database. New approaches to microscopy Eric Betzig: Beyond the Nobel Prize—New approaches to microscopy.